Heat is the secret to good Chinese, don’t you think, heat and the way you slice, so it all cooks just-right – and fast. One thing for sure is that Takayoshi Yao cooks just-right, and fast. 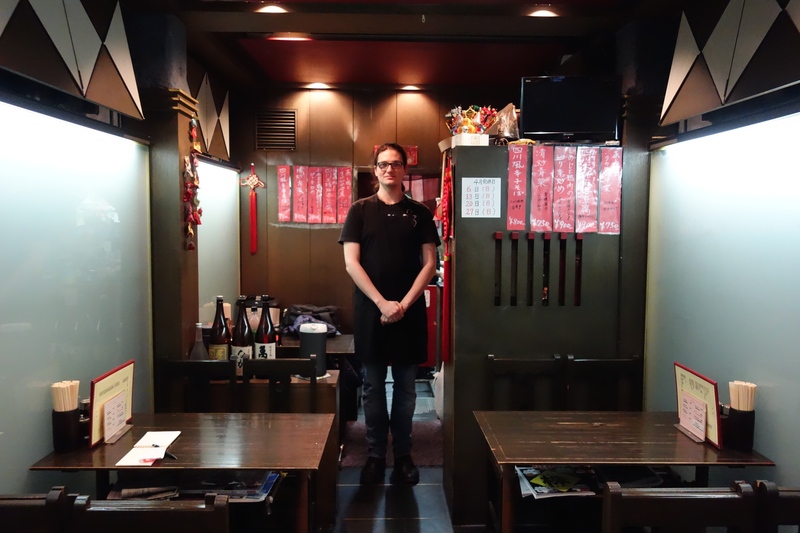 In the few minutes before opening time he fills some phone orders, reeling off a couple of mabo dofu – grandma’s beancurd – and something with scrambled eggs, while he tells you a bit about Fuku Rai Ken, his restaurant with the kanji characters that read Happiness Come House. But before this you’ve been chatting outside, because you wanted to know more about this sliver of a building, this slightly broken-down, retro-futuristic, battleship-grey five-storey tower, sandwiched between much bigger and newer structures down here on Asakusa Dori, between Kappabashi and Inaricho subway station. It has piqued your curiosity ever since you moved here. It wasn’t the easiest place to just walk into, despite the menus outside. For a start, it was difficult to see inside from the street. And the exterior looked built to weed out the casually curious. The restaurant often seemed full, or at the times you passed, it was closed. Was it a forbidden sort of gourmand club, like something out of a Tanizaki short story? 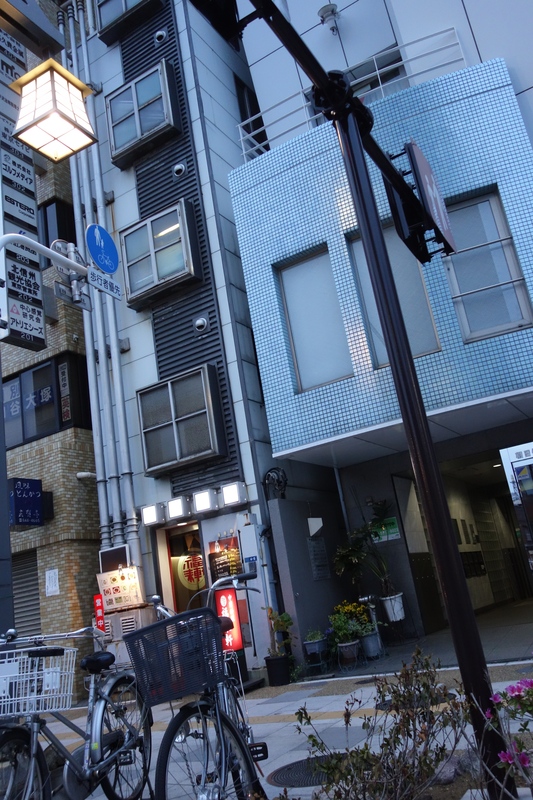 A place only for otaku? A diner for only Bladerunner fans? How many did it seat, anyway, like … five? So, these battered-looking pipes, you wonder, climbing to the sky, they are a bit like something from a steam-driven sci-fi flick. Are they to handle the heat from your secret power source, Mr Yao, inside this blast furnace-type metal cabinet beside the door? Hahaha, says Yao. 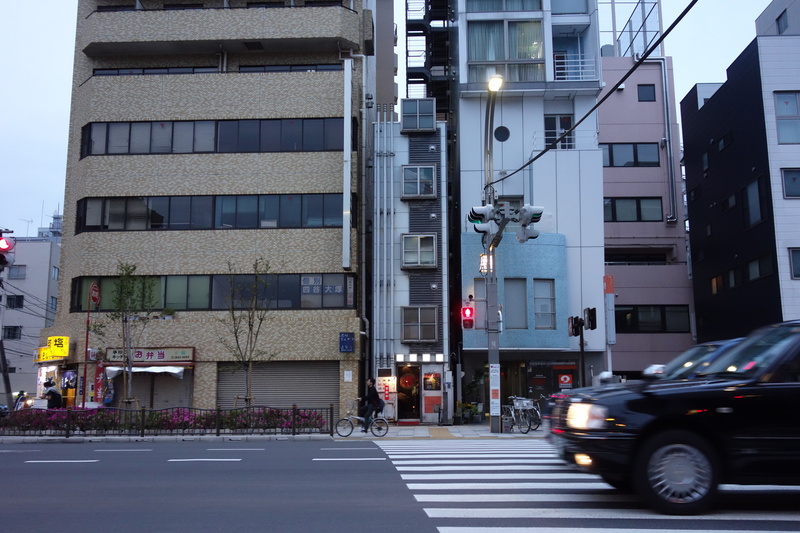 Many people stop and photograph my building. I would like to fix it up, but I don’t know where the money would come from. I don’t know who designed it, it’s had a number of makeovers and this one was done by my father and yes, I suppose it was during the Bubble era. Look in here, he says. He opens the furnace cabinet. It’s just some plumbing. He opens another rusty door at the side. Here is just the electricity meter. That’s all. Hahaha. And the pipes are just cosmetic, too. Look in here, he says. He opens the furnace cabinet. It’s just some plumbing. He opens another door at the side. Here is just the electricity meter. That’s all. Hahaha. We have been here for about 80 years, he says. My grandfather came from the port of Ninpo near Shanghai in his teens. 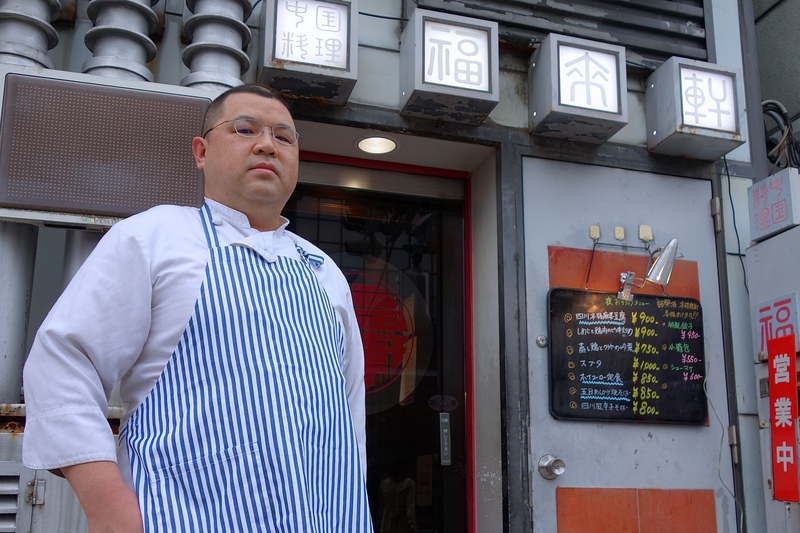 He worked here when it was a ramen shop, then when the master quit he took it over. That was in the 1930s, before the War. 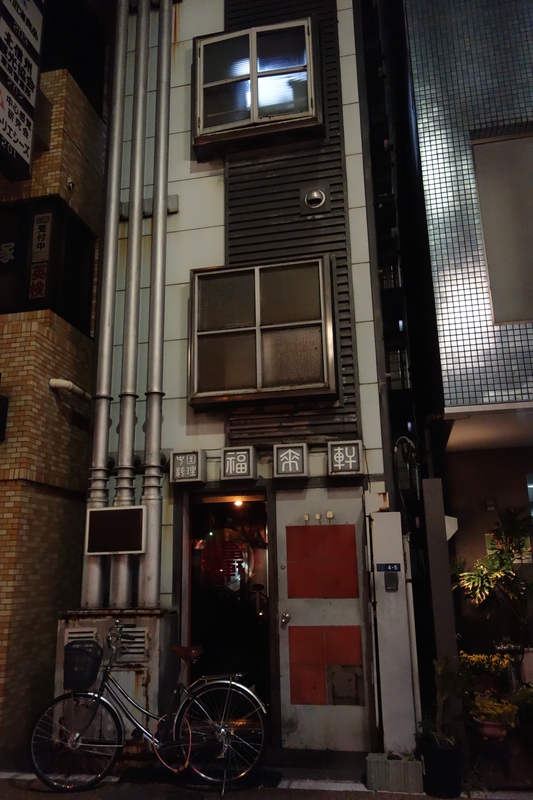 Grandpa opened a couple of other restaurants too, in Hamamatsucho and Suidobashi, and his other sons ran those. Dad took over Fuku Rai Ken until he retired last year. But he still comes to help when it’s busy. Yao’s sister Yuri is helping out tonight. She introduces herself in English. She calls her big brother Lung, that’s his Chinese name, Lunghsiang. I didn’t need a Chinese name she says, mine is the same in both languages. Although now, her married name is Japanese. We kids went to school around here and now my kids go to the same school. I don’t have any old schoolfriends, but Lung keeps up with his, and many come to eat here. She says her dad and mum used to run the restaurant together. Lung was working in a hotel when mum died and he came back to help dad out. A customer comes in to pick up her mabo dofu. Ooh, I guess you could call me a regular, she says. I’ve known Yuri-chan since she was a baby. Another fellow drops in to help out. Well, not exactly just drop in – he’s the waiter here. Alex was hired by Yao a month ago. He is 20-years-old and from Venice. 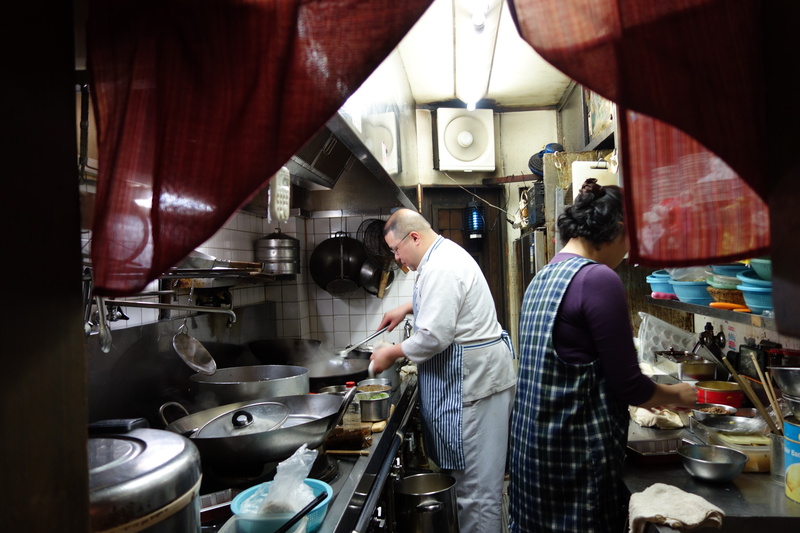 He has never had a part-time job before, much less one in a restaurant, and he doesn’t speak a whole lot of Japanese. But he’s doing all right. He’s a big young man and brings a presence to this space with just six tables. He speaks very carefully, and gently. Why am I in this restaurant? Well I’m Italian so obviously I’m interested in food, he says. But in high school, my teacher introduced us to Japanese philosophy such as Zen, so I have come to Japan to learn about that. I am studying at a language school right now, but I want to go to Tokyo University. Alex was the first person to answer my ad out on the street, Yao says. I figured he spoke good enough Japanese and he was conscientious. He makes mistakes but he’s just starting, and even if I get angry he puts up with it. At first he was going to quit, he said the job wasn’t what he expected and it didn’t suit him. But I convinced him to stay. I believe it’s a sort of en, it’s destiny, that Alex has come here. It’s a good cultural exchange to have him here, and good for our customers too. The tables start filling up, and Yao gets back to the kitchen. 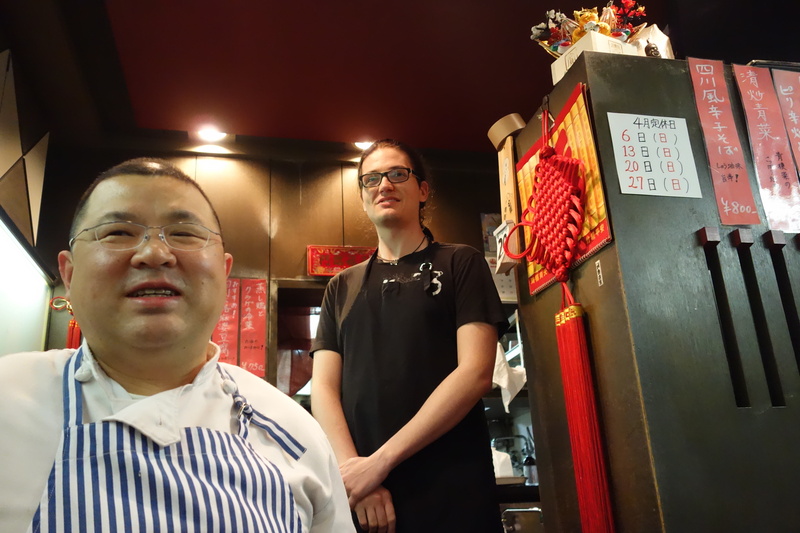 His most popular dishes are the gomoku yakisoba combination fried noodle, the hoikoro sweet miso and pork and cabbage, and the shimeji mushroom with chicken and chilli. And the mabo dofu. 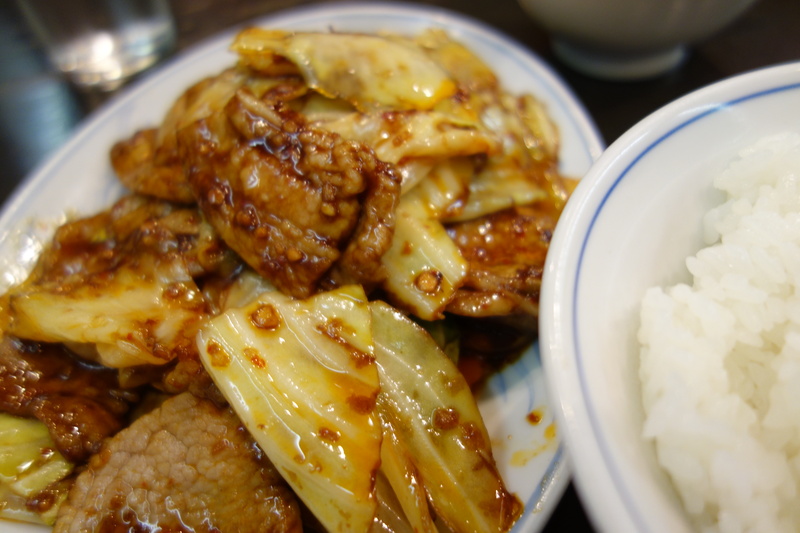 The chicken is pungent and hot like a Sichuan dish, and the hoikoro has big slabs of pork and crunchy cuts of cabbage. Yao’s style is salty and spicy. He is confident in his powerfully flavoured, high-intensity cooking. 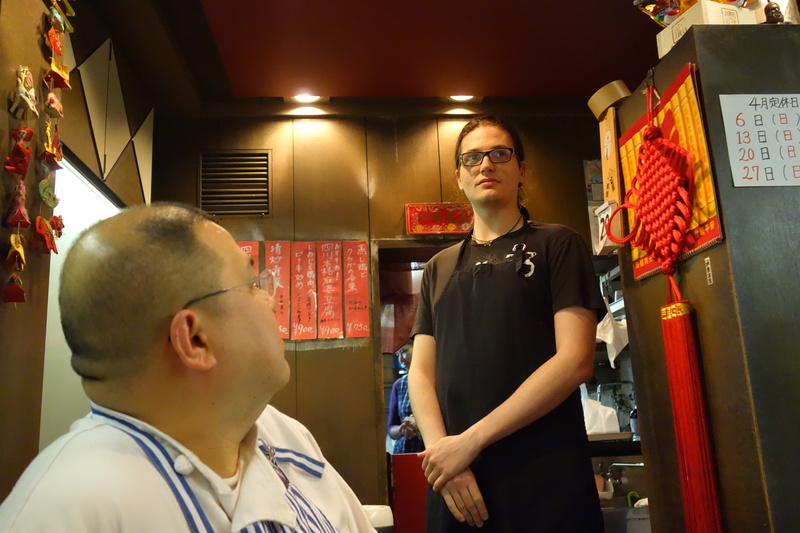 I believe we still do the most correct version of Chinese-Japanese cuisine in Tokyo, he says. Fukuraiken is at 1-4-5 Matsugaya, Taito-ku tel 03-3841-3118. Closed Sundays, and for a break between lunch and dinner.